This is the first complete English translation of Luke's Demonstration to Theophilus (the books of Luke and Acts) as found in Codex Bezae. Codex Bezae is a bilingual 4th century Greek-Latin manuscript. In the past it has been viewed as a marginal manuscript witness. 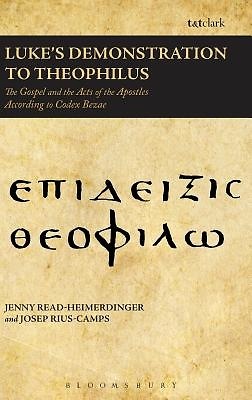 However, the pioneering work of Jenny Read-Heimerdinger and Josep Rius-Camps (The Message of Acts in Codex Bezae 4 vols, published by T&T Clark) has brought the variant readings in this fascinating document to the fore. Their work reveals that, far from being a late revision, Codex Bezae can be seen as one of the oldest versions of Luke's work in existence. This book presents the two texts unified in one volume, as Luke intended them, for the first time in any published edition. After an introduction explaining the importance of the Bezan text, as well as providing obeservations about its variances from other manuscripts a meticulous and continuous Greek transcript is presented together with the English translation on facing pages. This will prove an indespensible reference tool for scholars of Luke-Acts.